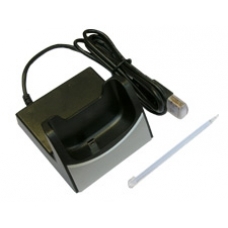 This USB cradle is specially designed for the HP iPAQ rw6800 series personal messenger. It will sync and charge your handheld via the USB port on your computer / laptop. Now you can have a cradle sitting on your desk, preventing your iPAQ handheld from scratches / dents. Also includes a plastic stylus and handy stylus holder on the cradle.